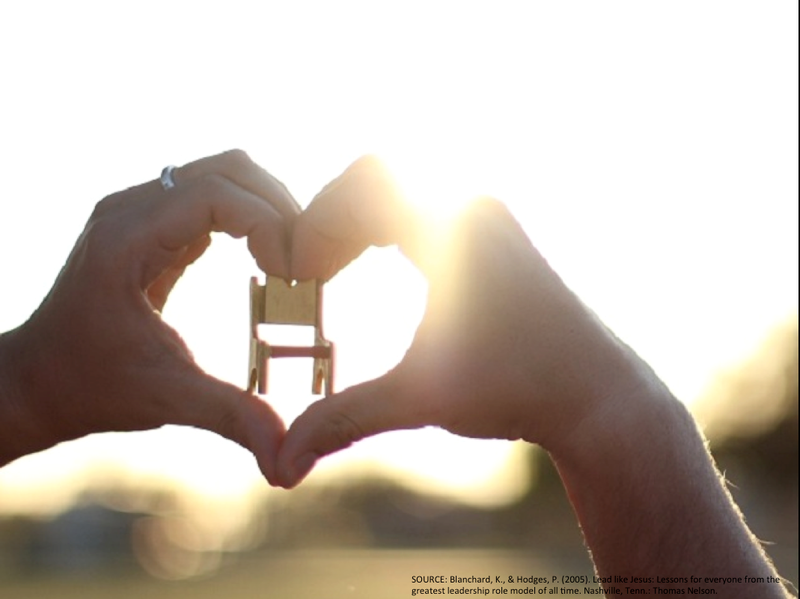 This is the throne of your heart. The person that sits on the throne of your heart is the one who directs your life. Of course, Jesus wants to be that person, but He allows you to choose each day and even each moment who will sit on the throne of your heart. I’m not talking about your salvation. I’m talking about who is Lord over your life. I’m talking about who you give authority to in your life each moment and each day. 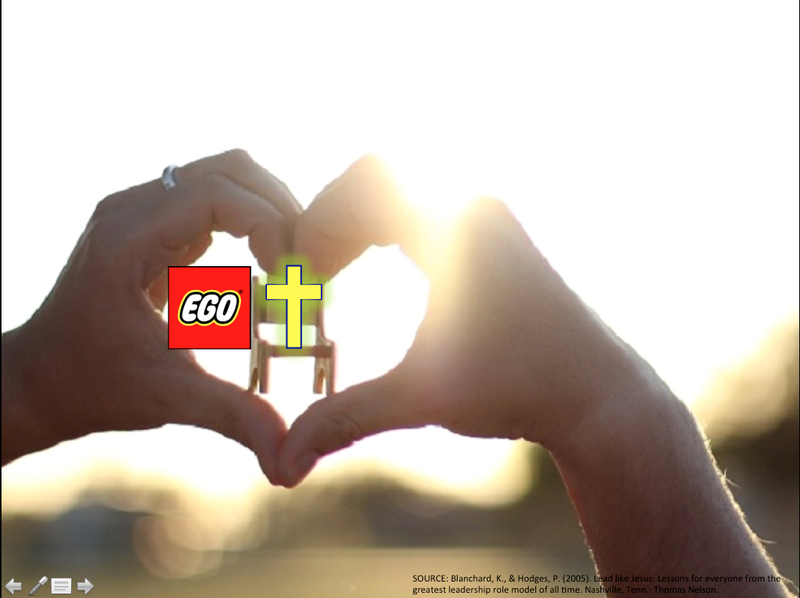 Because even after you’ve asked Jesus into your heart, He still has competition for the throne from your EGO. EGO is a term coined by Sigmund Freud for the part of your mind that coordinates communication between your conscious and subconscious, but it has come to mean “your self-importance.” It’s the need to feel that your SELF is important. 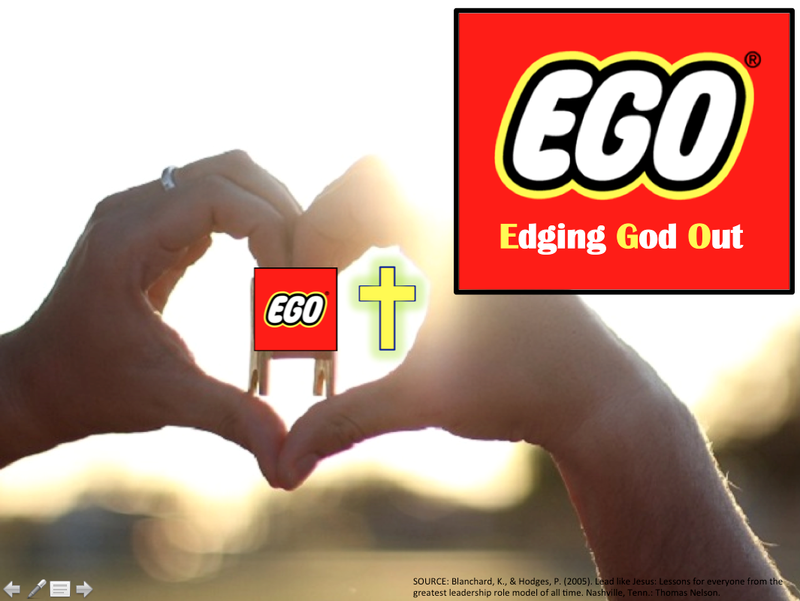 Another way you can think of EGO is E-G-O, and it stands for Edging God Out, because that is exactly what your self-importance does. EGO Edges God Out so that it can take the throne. Your EGO wants to make YOU the king of your life instead of Jesus. This is a TERRIBLE idea, because pushing Jesus off the throne of our hearts kills our desire to please God. When EGO sits on the throne, we are motivated by Pride and Fear. Let me take you to the chalkboard and show you what I mean. The Bible talks a lot about Pride and Fear, but let’s just look at two Scriptures as examples. Romans 12:3 tells us that we should not think of ourselves more highly than we ought, and Proverbs 29:25 tells us that the fear of man is a snare. Both Pride and Fear are a trap, and we have to be careful to avoid them. When our EGO sits on the throne of our heart, our heart is pulled by two powerful desires. The desire to Promote Ourself – Pride…and the desire to Protect Ourself – Fear. This is because EGO thinks SELF is so important that it should be both Promoted and Protected. When we Promote ourselves (Pride), we exhibit certain behaviors. We do these things to Promote SELF…to get people to think highly of us. When we Protect SELF (Fear), we exhibit different behaviors. Because EGO thinks SELF is important and needs to be protected from all threats. We are all motivated by these two things much of the time. But here is why we need to invite Jesus back onto the throne. 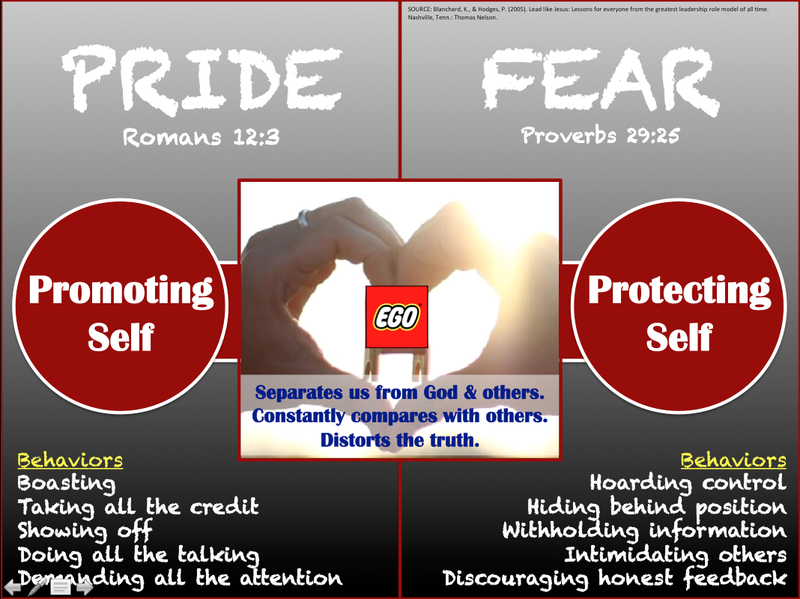 Pride and Fear separate us from God and from others. They isolate us. They distort the truth. I think I deserve the recognition (even though I only did a little piece of the work). I think he’s attacking me and that I have to save face (even though his motive might be to gently correct me). 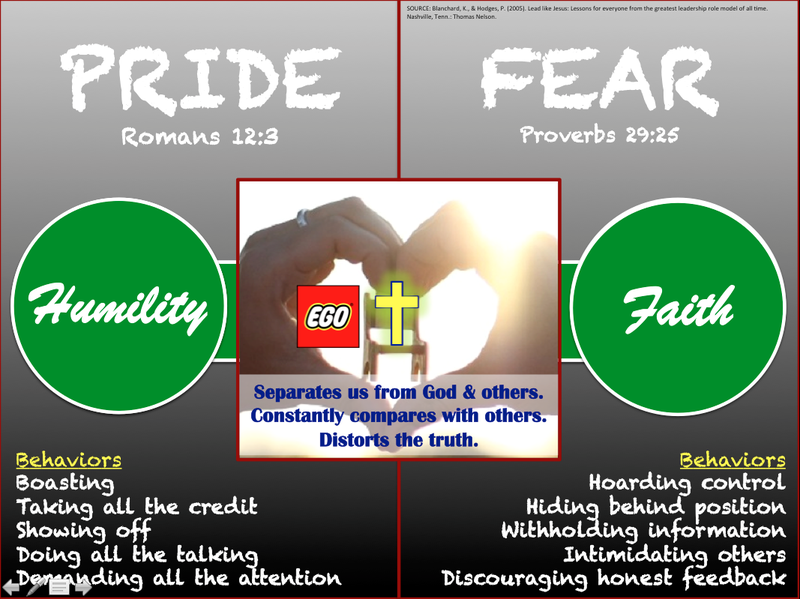 The antidote to Promoting SELF (Pride) is Humility. And the antidote to Protecting SELF (Fear) is Faith. But it’s not possible for you to practice true Humility and Faith without Jesus. We’ve got to put Him back on the throne of our hearts. 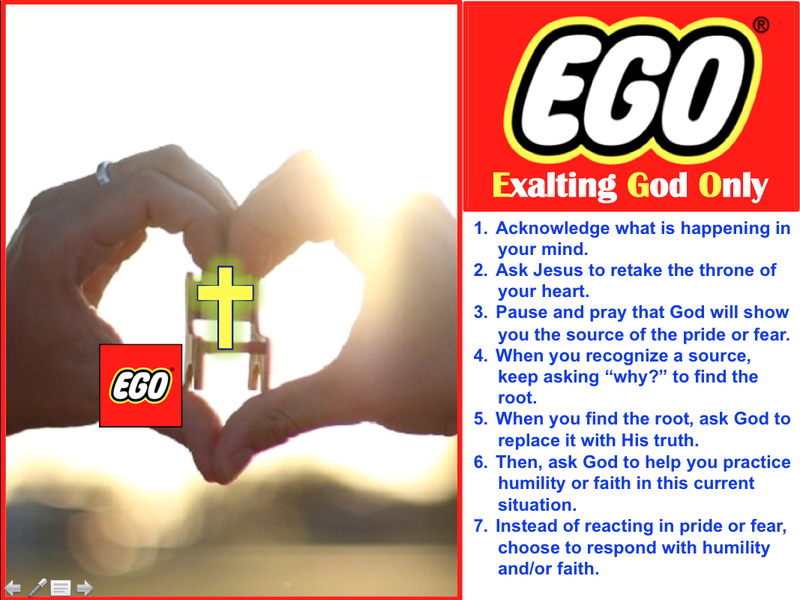 So, let me give you a few steps to redeem your EGO and put it in proper relationship to Christ. Instead of Edging God Out, your SELF can Exalt God Only. Here’s how. Ask Jesus to retake the throne of your heart. Pause and pray that God will show you the source of the pride or fear. When you recognize a source, keep asking “why?” to find the root. For example, I get an email from my boss, and I feel fear. Why? I am afraid my boss is unhappy with the work I turned in. Why? I am afraid that it won’t be good enough. Why? If he says it isn’t good enough, it feels like he is saying that I’m not good enough. Why? When you find the root, ask God to replace it with His truth. Then, ask God to help you practice Humility or Faith in this current situation. Instead of reacting in pride or fear, choose to respond with humility and/or faith. Keeping EGO off the throne of your heart is difficult, and it takes practice. Don’t get discouraged. You will get better and better as you continue to invite Jesus to the throne. NOTE: This devotion is an adaptation of the work of Ken Blanchard and Phil Hodges in their book Lead Like Jesus. It helps us understand how important it is to keep Jesus on the throne of our heart so that we can avoid being controlled by pride and fear. You can find the slide deck and a self-assessment on the Lesson and Material Downloads page. (Click the link or see the tab at the top of the screen.) Then, scroll down to “Pride and Fear” in the alphabetical list. I was at a meeting with some of our leaders from part of my ministry a few weeks ago, and we were discussing the topic of failure and how it is perceived within our organization. We agreed that there is an unspoken rule that failure is NOT okay. We will go to great lengths to prevent failure or even to cover it up and make it look like success when it does happen. You may think I’m cynical, but I believe Jesus even set them up for failure on certain occasions. He knew that they wouldn’t succeed, but He let them try anyway. Why? Because failure gives birth to growth and learning, maturity, character, humility, a teachable spirit, dependence on God, empathy for others, and even innovation, transformation, and revival! 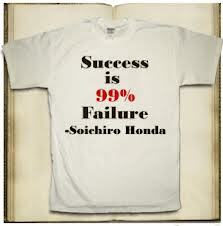 We learn sooooo much more from our failures than we do from our successes. Are we missing out on God’s best for us when we work so hard not to fail? Recognizing this problem in their culture, here’s what one region of our ministry did. They flipped failure on its head. Instead of hiding failures, they required their leaders to celebrate them. In every leader’s performance appraisal for the past few years, they have had to share an “excellent failure” for which they were personally responsible. An “excellent failure” is a failure that taught you something, that gave you a new perspective, that prepared you, that matured you, that shaped you to be more like Christ. It’s a failure that produces a harvest in your life or ministry. And for it to count, you have to own it. You’ve got to identify what you did or did not do that made things go wrong. You’ve got to say, “I failed,” or else the failure has no power to change you. You can’t dilute it by saying “we” or “my team” or “because they.” There may be truth in those statements, but the failure won’t be transformational for you until you acknowledge your part. So, what do you think? Do you have the courage to own your failure? Are you willing to put your name on it and see what God is willing to do with a transparent and humble leader? As a group, read the following Scriptures, and then discuss the questions below. How does God feel about weakness? How is this different from how the world often feels about and acts toward weakness? How are we called to respond to weakness? How do these Scriptures relate to the weaknesses people have in regard to the work that they do and the relationships that they are in? Do you think God wants us to fix our weaknesses? Why or why not? This game helps participants to understand how challenging it is to get feedback “in under the radar” without raising the intended recipient’s defensiveness. Participants will enjoy trying to get beanbags into a target. The beanbags represent their feedback, and the target represents the recipient’s heart. o Create a target on the posterboard. Start with a 6” x 6” circle in the middle. Then draw concentric circles around it, making each new one about 6” bigger all around. o Write point values in each of the circles. The center circle is worth 50 points. The next, bigger circle is worth 25. The next, bigger circle is worth 15. The next one is worth 10, and if you have any edge left on the poserboard, you can mark that worth 5 points. o Buy or make your bean bags. o Place the posterboard targets on the ground, and mark a boundary for the throwers with a piece of tape on the floor. It should be about 8-10 feet away from the target. o Mark three more lines of tape on the floor at 25%, 50% and 75% of the way between the throwing line and the target. o Mix up the 6 half-cards, and put them into a bag/pouch. 1. What was challenging about the game? 2. If you compare the game to giving someone feedback, what comparisons can you make? 3. What types of things make people’s defensiveness go up? 4. How can you give feedback in a way that won’t make people defensive? 5. Read Proverbs 15:1, 18 and 21:23. Do these Scriptures give you any additional ideas? This object lesson teaches about why God scattered the people after they tried to build the Tower of Babel. Stackable items (e.g., blocks, sugar cubes, cups, etc.) You will need at least enough for each person to have one, and you may want to have enough for everyone to have more than one to increase the level of difficulty.